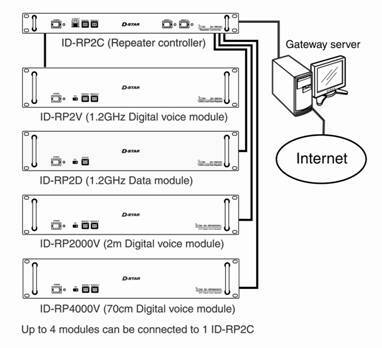 There is one part that is common to every D-STAR installation, that is the controller, the ID-RP2C. The first three modules are repeaters. They operate full duplex and have both a transmitter and a receiver in each one. The last is the High Speed Data module. It is not a repeater. It has a single transceiver in it. If you were to use individual antennas for each module, you would need a total of 7 antennas, 2 for each repeater and 1 for the High Speed Data module. But most folks would rather use isolation cavities. If you are using cavities, the most common configuration is a duplexer for 144 MHz, a duplexer for 440 MHz, and a triplexer for both 1.2 GHz modules. Using the TX/RX isolation curves at	http://www.txrx.com/products/pdf/genta_2.pdf and the fact that all transmitters are at 40 watts or less. 85 db isolation would be needed for a 144 MHz channel with a 600 kHz split and 58 db isolation would be needed for a 440 MHz channel with 5 MHz split. Tx/RX, as a D-STAR supported has created a triplexer configuration for the 1.2 BHz modules. With any repeater installation, it is imperative to use low loss coax to reduce the loss to the antennas. With the 1.2 GHz radios, this is especially important. skimping on the coax will cause range degradation and can also impact operation with stray signals entering the system. There are no antennas made for repeater duty that support all three bands and very few choices for even two bands. This causes a compromise with either utilizing Amateur grade antennas or using separate antennas for each band. One of the most impressive part of the ID-RP2C is the size of the fuse holders included. The fuses are rated at 30 A. The large requirements is because all of the radio modules plug into the controller for power. If all radios are transmitting at the same time, approximately 30A 12V DC current is required. CentoOS 5.1 is the recommended operating system. It is downloadable as 5 CD ISO images. see www.centos.org for download sites and images. The i386 version is recommended for most installation. The speed of the Internet connection can vary dependent on the number of repeaters that are connected in multicast operation. 256 Kbps is considered minimum and if fully loaded, the connection would require 1080 Kbps. A static IP is not required. It would be advisable to have the public address registered in some sort of DNS to allow you users to easily register. With dynamic addresses, this can be done through services such as no-ip. Most sites will desire to have uninterruptable power sources. For a D-STAR installation this will normally mean a 120VAC UPS and a batter bank for 12V. The D-STAR system requires a router to provide address translation between the Internet and the local network. The router also provides firewall services by allowing only specific ports to be accessed from the Internet. The internal network utilizes a 10.0.0.0/8 address space that has a net mask of 255.0.0.0. Not all routers, especially home focus routers are capable of specifying a 255.0.0.0 net mask. The following routers are suggested. Any router that runs dd-wrt firmware will work -	http://www.dd-wrt.com/wiki/index.php/Supported_Devices . Version's 1 to 4 of the WRT54G can often be found for $30-$40 on ebay. Later versions work but are harder to fit with dd-wrt.